My 6-Step Design Process — Stevie Storck Design Co. If you’ve never worked with a professional interior designer before, you may be wondering how the whole process works. While each designer has their own methods, I want to share the steps my full-service projects go through, from start to finish in completing a room makeover. You may know I also offer E-Design Minis and E-Design Consulting to clients nationwide, but this blog post is focused on my in-person services which are available residents of south central Pennsylvania and northern Maryland. When I receive a new inquiry, the first thing I do is spend some time getting to know you! I usually ask a few questions in that first email and then will often schedule a complimentary 30-minute phone consultation where we talk through your needs and I answer any questions you may have. Next we will schedule your in-home Interior Design Consultation, a two hour appointment where we will lay the ground work for your room project, from defining your style to problem solving tricky areas and practical considerations that suit your family’s lifestyle. After your Design Consultation, I get to work preparing a custom proposal I call your Project Guide. This will include a visual inspiration collage that captures your style goals, a project budget sheet to help you plan your investment, a floor plan and summary of my design notes from your consultation and a quote for design services moving forward. Your Project Guide PDF will be delivered via email, typically 2 weeks after your consultation date. The next step is to pinpoint the direction we want to take your project. I design 2-3 Mood Board concepts for you to choose from. These Mood Boards will have photos of real items you can actually purchase for your space, with a focus on just the main furniture and key accessories to get started. So for a living room, that might be the sofa, chairs, rug, coffee table, etc. I order samples and research materials where applicable and compile the options into a Specification List with product info, pricing and sources. I’ll present all this information to you at our first Design Meeting, where we can talk through the options and settle on one favorite concept to move forward with. After the Design Concept has been approved, then we can set to work finalizing the details. In this phase, I’ll create more developed drawings of your room design and source things like accent furniture, lighting, textiles and accessories. Depending on the size of your project or if it includes renovation, we may have one or two more Design Meetings before we move onto the implementation stage of your design. I will finalize your project Specification List and total up the costs for furnishings and assist you with getting estimates for any work involving the trades (i.e. electrical, plumbing, carpentry, etc). Next up is shopping! I provide full-service purchasing, order management and implementation for local interior design clients. We start with custom orders, which take the longest time as these items are made to order, then work down the list completing online orders and shopping in local stores. I follow up after orders have been placed, keeping track of estimated delivery dates, being on-site to accept deliveries if you can’t be, troubleshooting any issues with shipments or making returns/exchanges if necessary. Once all of your orders have arrived, we’ll schedule an Install Day where my team and I will arrange your new furniture, load-in new accessories and accents, hang artwork, install window treatments and style out your room. 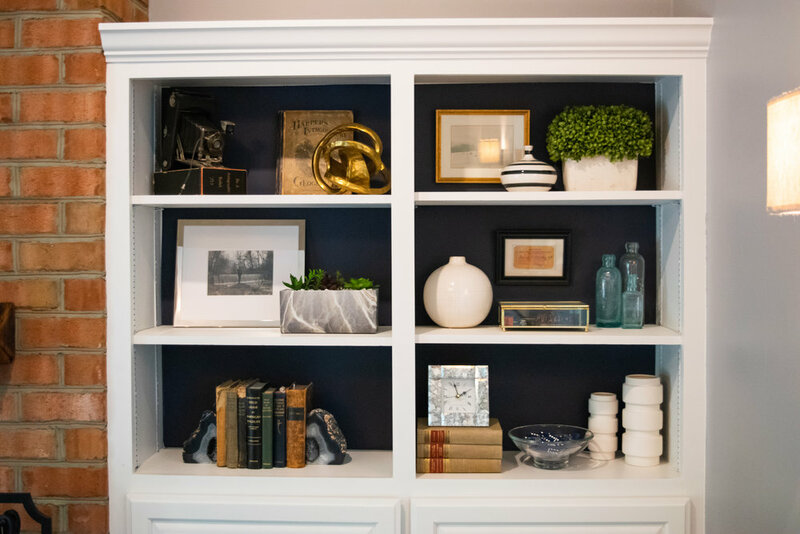 While we’re there, make a punch list of any last items we need so we can come back to put the finishing touches on your space and photograph it! There are many variables that make each design project unique, but all of my client projects more or less go through these same 6 steps! I hope this was helpful in illustrating a bit more of what I do and how my design services work. Have a question? Comment below or shoot me an email at stevie@steviestorck.com.